During World War II, Rabaul on the island of New Britain in what is now called Papua New Guinea was the major Japanese bases in the South Western Pacific. Ships from Japan and Chuuk Lagoon (Truk Lagoon) would travel to and from Rabaul and then onto the frontline in places like the Solomon Islands and other parts of Papua New Guinea. Rabaul has a very large and protected harbour, which made it such a perfect place for a naval base. About 80% of Rabaul is surrounded by volcanoes. These are either active or dormant, but back in the time of the war, they were all basically dormant. The volcanoes form a small mountain chain around the harbour and provide even some protection for ships to the north of the town. North of Rabaul the coastline runs basically north-west to south-east. At the north-westernmost end of this section of coast there was a submarine base. This base was located under a large hill and had four tunnels that came out onto the shore right above the water's edge. The ocean below these tunnels drops away to a reputed 300 metres, making it perfect for submarines to hide while waiting their turn to surface to be resupplied. To the west of the submarine base is a small bay. I imagine that the Japanese used this bay to shelter ships that were waiting to resupply either the base or the submarines. George Tyers was a trained hard hat diver who worked with the 13th Works and Parks Company in Finschhafen which is in Marobe Province during the War. In 1968 he came to Rabaul and ran the Rabaul Garage. In 1970 he started salvage diving with Pat Roberts. When he was in Australia one time, George met an Australian who was a pilot with the Royal Australian Air Force during the War. The pilot told George how he had bombed a Japanese freighter on the northern side of Rabaul during the War. When he returned to Rabaul, George went to the area to the immediate north of Rabaul. Using the pilot's description , he found what he thought was the location and he went for a snorkel. He soon discovered the ship, it is located only a short distance from the small bay and is only 10 metres under the surface. 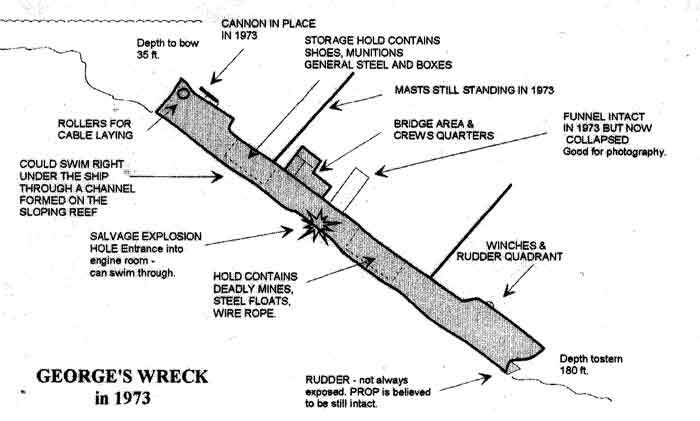 From that day on, the wreck became known as "George's Wreck". It is still known as that as no-one has yet been able to identify the ship for certainty, although there is a possibility as I will show later. 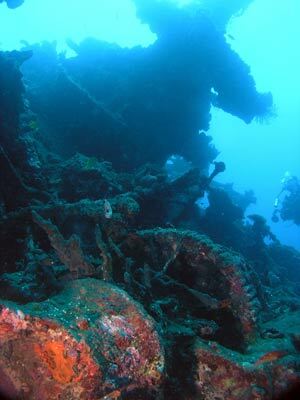 In June 1973 Fritz Herscheid, a salvage diver based in Rabaul, started negotiations with the Papua New Guinea authorities to obtain the salvage rights to George's Wreck. On 6 August 1973 he was granted the rights. His main reason was to use this wreck to "launder" the 60 tons of metal that he had salvaged from other wrecks that he did not have the rights to! 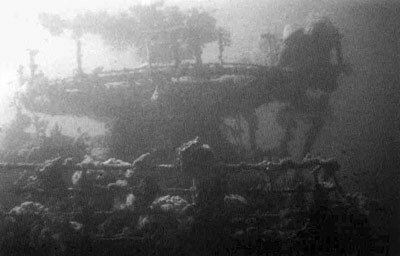 Fritz considered that the small size of George's Wreck was really not worth the salvage effort, but he had to be seen to dive and do some work on the wreck so that he could claim that he got all the metal from it. He worked the wreck normally on his own, but at times he was assisted by his brother Peter, Tony Bryan, Don Lawton and Doug Doodson. He decided to blow open the wreck at the engine room, not from the outside as is the norm, but from inside. This way used less explosives and also, he wanted to minimise the explosion as the hold behind the engine room contained a huge number of mines. Fritz put the explosives in three and four foot lengths of old discarded three inch firehose. The explosive was AN90 which had been delivered in a 300 pound package to him. Each length of firehose had the explosive added together with sand. This was to weigh the package down. Each end was secured with rubber bands made from bicycle inner tubes. On one day he did three bounce dives to the wreck and took all the explosive packages to the deck of the wreck. The next day he went back to the wreck and as he descended, he saw that the bow had bare metal and lots of the coral was missing. He dropped over the bow and immediately saw that the bow gun was gone. He swam further down the wreck and found the gun on the deck in front of the bridge. Someone had dived the wreck soon after he had put all the explosives on the wreck, stolen some and used it to try to remove the gun. A few days later Fritz discovered that the someone was Ian Short. Why he had destroyed the picturesque bow gun remains a mystery. Fritz continued to the explosives and took as many as he could into the wreck. Just as he got to the position where he wanted to leave them, his brand new Healthways regulator failed. He thought he had picked up a half full tank and knocked on the reserve (back then there were generally no gauges and once your supply fell below a certain amount your air supply started to get hard to breath so you pulled a lever and got more air but had to ascend relatively quickly). However, when he pulled the lever, he did not get more air. He tried to look for the way out but it was stirred up and he could see nothing. He turned off ths torch and could just make out the skylights. He bolted for them and by the time he reached them was was sure that he was about to pass out. Then, as he started a missile-like ascent, his regulator gave him air. He swam over to the funnel and hung on, sucking air till his breathing became normal. He never used that reg again and still has it to this day. The next day he went back to the wreck. For that and the next two days he wired the explosive charges into place, doing two dives a day with a 20 minute bottom time (at 42 metres). He placed the charges in a H pattern. The day after he connected it all up to the detonator wire and back in the dinghy with his brother Peter, he set off the explosion. The hole it blew was good, but he needed to set off some smaller explosives to tidy it up. While doing this, Fritz made a huge mistake and did not keep track of the time. He had been at 42 metres for 35 minutes! He started to ascend but he did not have enough air to do the decompression he knew that he had to do at about nine metres so he went shallower. As he did, he felt a pain in his left shoulder. At six metres it hurt, at four metres it was unbearable. He was bent. He dropped back to nine metres and the pain went away. His air lasted five minutes and he had to ascend to get the second tank that his "boy" Bambi had on the surface. As he passed three metres his left arm became useless. He surfaced and yelled to Bambi to bring him the spare tank. He dropped back to four metres and surfaced when Bambi was close by. He grabbed the tank and dropped back to six metres. He swapped the tank to his regulator underwater. Over the next 90 minutes he gradually ascended to hour metres. His air ran out and he ascended. He had a terrible pain in his shoulder but at least he was able to move his arm. He had to walk back to the village as he had not brought the dinghy this day. As he could not use his arm to change gears (and Bambi did not know how to drive), he had to drive while Bambi shifted gears. Soon after leaving the village on the 20 minute drive back to Rabaul, Fritz met his brother Peter. After the problems a few days ago, Fritz's wife Janice had become worried when he did not return on time and sent him to see what was the problem. Peter raced back to Rabaul and grabbed oxygen and a recompression set up and go to the wharf and get ready. Fritz arrived back at the wharf and immediately entered the water to do over three hours of decompression. When he surfaced, his shoulder was tender but he had full movement. 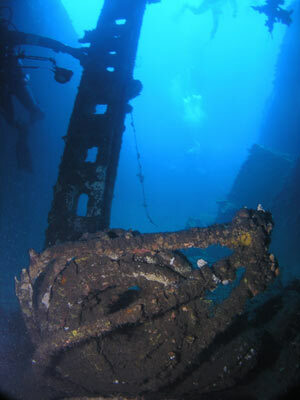 Less than a week later Fritz was back diving on the wreck. On Saturday 8 September 1973 Fritz dived the wreck with Don Lawton. They used a block and tackle to move the condensor to right next to the salvage hole. After exiting the water and resting, they received the terrible news that Don's fiancee, Mary Bronkhurst, had died while diving the Sub base only a bit over a kilometre from George's Wreck. The next day Fritz was back at the wreck.He and his brother raised the three and a half tonne condensor and took it to the shallow water off the village. He later used explosives to break it up (and in the process bursting his ear drum). He later salvaged more metal from the wreck. 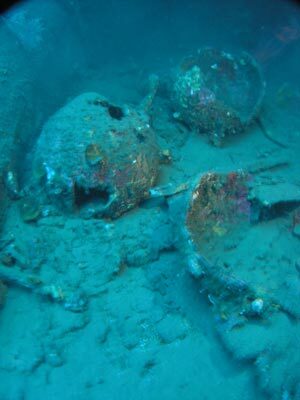 All this was mixed with metal from the other wrecks and legitimised. 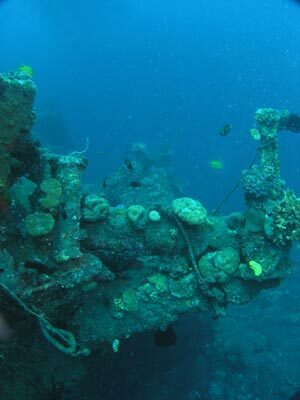 Fritz believes that George's Wreck is probably the wreck of the Toyo Maru. 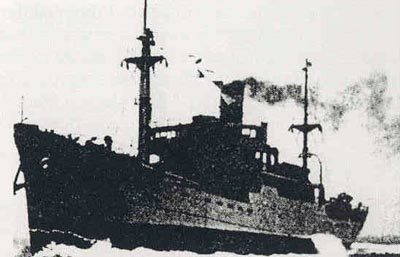 He says that the The Imperial Japanese Navy in World War II, Vessels Lost lists the sinking of the 1,916 ton Toyo Maru, a cargo/cable layer sunk at Rabaul by the USAF on 8 April (or 4 August?) 1943. More about this ship when I research it. George's Wreck is located at GPS S4° 8' 55.2" E152° 10' 37.3" using WGS84 as a datum. The wreck is only about 20 to 30 metres from the shore. As mentioned, the bow is only 10 metres deep. The ship sits upright on a very steep slope (perhaps 40°). The bottom under the stern sits at 55 metres. The top of the stern is about 50 metres. 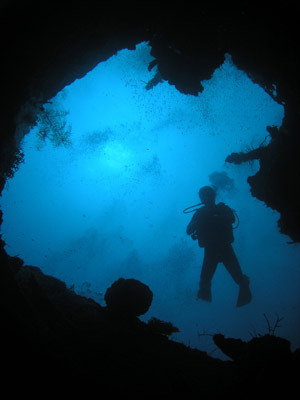 This wreck is suitable for everyone, even divers who are not keen on diving shipwrecks. This is because there is excellent marine life on the wreck as I will later explain. 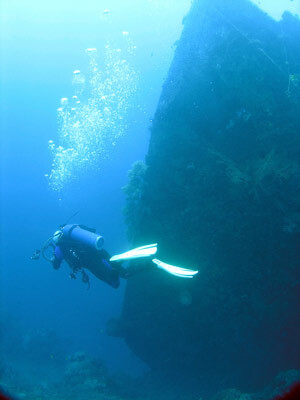 In addition, you can go as deep as you like, there is heaps to see for even the most inexperienced diver. I will start this dive description from the stern as this is how you would normally dive the wreck. From the bow, head straight down the starboard side of the deck of the ship to the stern. As you go, look at how steep the bottom drops off on this side. It will only take you a couple of minutes as it is only about 60 to 66 metres long. The stern is rounded and there are a couple of large winches here. Drop under the stern and you will see that the propeller and rudder are not visible, buried in the coral and sand. You can get some good photographs from this angle. You only need to go to about 52 metres. Ascend back to the deck and you will notice that there is no gun platform. This is unusual, as most Japanese freighters used for resupply of the Japanese Imperial Forces had one or two large guns mounted at bow and stern. There is a stern mast and the rear Hold 3. Drop into the hold and look around. From memory, this hold is empty. There is said to be a hole on the starboard side in this area but I did not see it. The funnel is in Hold 2, having fallen here. There are also some mines, most opened up through rust action. There is a coal bunker in the forward section of this hold. On the port side here there is a large hole. This is blown from inside to the outside and is the salvage hole put there by Fritz Herscheid in 1973. In this area there is a bath and above on the deck, there are the engine room skylights. The engine room is quite tight, so it is not recommended that you enter it. The bridge is forward of the engine skylights but there is not much to see. In front of this is Hold 1. This has some cables or hoses and perhaps a tyre. There is also a medium sized aluminium water container (similar to the ones in the Nippo Maru in Chuuk Lagoon). The bow has a forecastle that can be entered (more about this soon). There are more winches on the deck and on either side of the bow, a few metres back, there is a large horizontal roller that was apparently part of a cable laying mechanism. The starboard anchor is there, but the port anchor is missing. 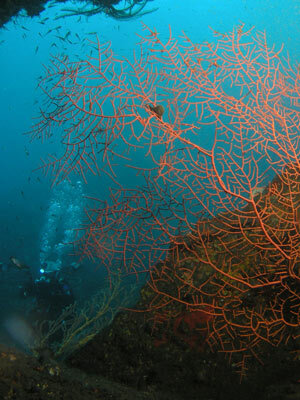 There are lots of large gorgonias on the port side of the hull adjacent to Hold 1 and the hull is rippled on this side. The bow has a large hole on the port side under the forecastle. This has a very nice gorgonia growing in it and you can get some excellent photographs from inside and outside. As mentioned, this wreck is on a slope, making it the almost perfect sort of wreck. You can ascend as you gradually go, never getting into decompression. 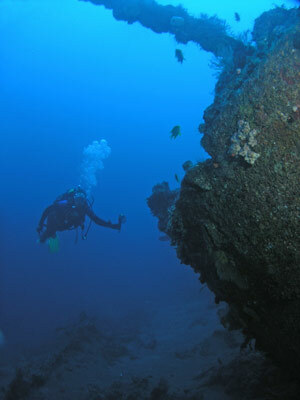 At the end of the dive, head the short distance over to the reef and spend your safety exploring the corals. It is a great end to the dive. As mentioned, this is an excellent dive, well worth doing at least once. If you have time, do it a couple of times.